When you cancel Private Registration, anyone can see your your name, mailing address, email address, phone number and other personal information in the public Whois database. Required: If your domain has Protected Registration enabled, you must cancel Protected Registration before removing privacy. 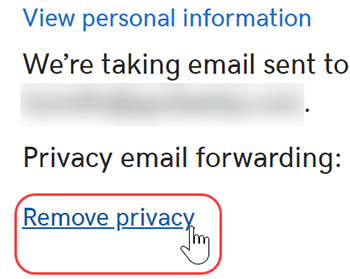 Under Contact Information, click Remove Privacy. You will receive a confirmation alert. Click Yes, Remove Privacy to complete removal. Note: It can take up to 24 hours for privacy to be completely removed from your domain name. After removing private registration, you can transfer your domain name. Or you can move your domain name to another account. If you change your mind, you can add private registration back to your domain name.